Inverness CT boss John Robertson. Hearts legend John Robertson jokingly hit out at Celtic boss Brendan Rodgers' criticism of the Tynecastle pitch. The Inverness CT boss spoke to BT Sport prior to Sunday's 5-0 thumping from Hearts about the length of the grass at the ground. It followed the Rodgers' comments after Celtic's 3-1 win over the Gorgie side in May. The Northern Irishman branded the Tynecastle pitch "embarrassing" in a stinging rebuke. He said: “We couldn’t play our normal game today. The pitch, I’m actually a little embarrassed with to be honest, for Scottish football and the standards you’re trying to create throughout the country. “The pitch was so long the players couldn’t pass on it, and that’s both sides." 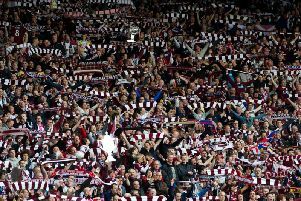 Hearts have since invested nearly £1 million pounds into a new hybrid pitch. Yet, the new surface did not stop Robertson poking fun at Rodgers. He told BT Sport: "There was a fantastic phone call. Craig (Levein) was very good, he phoned me up and we were talking about the new pitch and he says 'you've got a choice of four cuts. You can have very short, short, medium or Celtic'. So we decided to take the very short option today. "I don't know what Brendan's got a problem with, it looks great!" It was reported earlier in the week that the SPFL rejected a proposal for a rule to regulate the lengh of pitches.